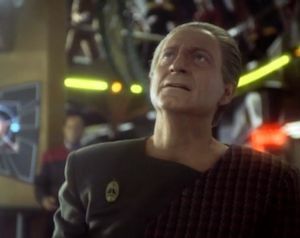 After Odo explores a possible link to his past with his father-figure, Dr. Mora, it appears that a shapeshifting monster is causing mayhem aboard Deep Space Nine. The actor who plays Dr. Mora is the same man who plays Admiral Jarok in "The Defector." I really like this guy. Odo and Mora really do have the same hairstyle. I'm glad we had "The Forsaken" to prepare us for Odo's bristly reaction to meeting Dr. Mora again. When the fourth member of the away team is missing for half a second, it's hard not to be certain he's fallen victim to the red shirt phenomenon. O'Brien crawling through the ducts and coming across a bunch of slime is reminiscent of Alien, and the idea of a shapeshifting alien monster running amok is similar to The Thing. I guess that settles it: "Constable" is a nickname, not an official title. There are a lot of loose ends at the end. What's the deal with the obelisk? What happened to the sample, and was it related to Odo? What were the DNA traces picked up from the planet? Why was all that crazy toxic gas released as soon as the obelisk was removed? Why was Dax acting funny? I don't get the title at all. This is a good episode that really pivots upon the character of Dr. Mora. It would have been easy to make Mora one-dimensionally sympathetic or unsympathetic, but the writers grappled with the more difficult task of making him a flawed character with both kinds of traits. There's the obvious parent allegory--so obvious even the characters comment on it--and that gets poignant by the end. But it's also a good monster yarn along the same lines as TOS' "The Man Trap" or TNG's "Aquiel," along with a good story to juxtapose the relationship between science and investigation. The fact that it continues to build Odo's character and backstory is really just a bonus. This is the first mention of Sisko's father, who we will eventually meet in "Homefront." The strained relationship between Dr. Mora and Odo isn't fully resolved until we see Mora again in "The Begotten."